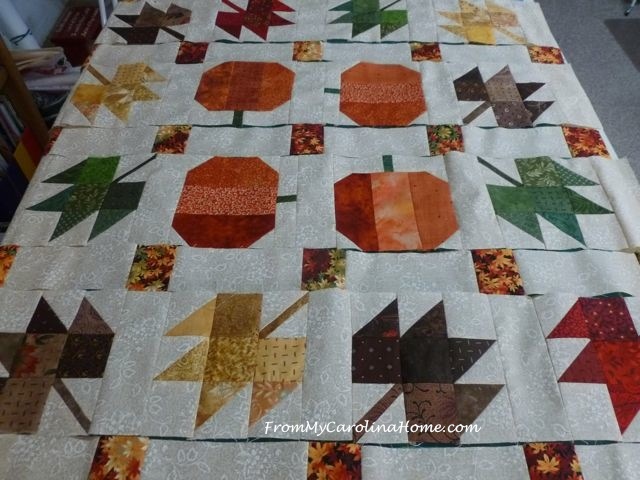 Today’s table topper is the largest of the Autumn Jubilee projects. It is designed with some sashing and cornerstones to separate the blocks a bit, adding another level of interest to the finished piece. Our sponsor for today’s post is Backside Fabrics, a fabulous North Carolina online store with wonderful wide backings of nice quality fabrics. Read more about how to enter the giveaway at the end of this post. 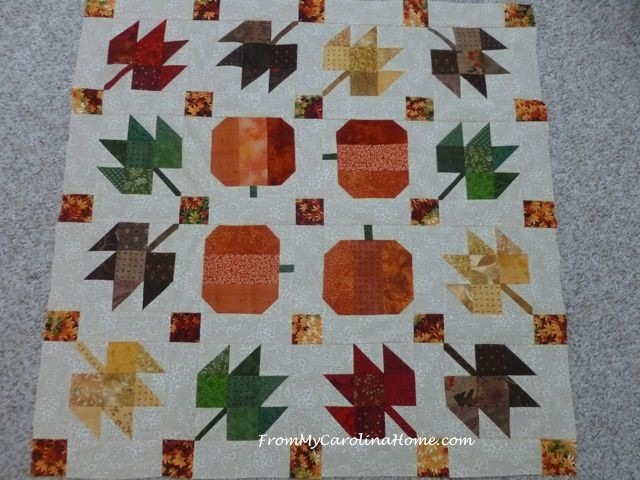 With four pumpkin blocks and 12 leaf blocks in assorted colors, you will need to cut 40 sashing strips 2-1/2 x 6-1/2-inches from your background, and 25 cornerstones 2-1/2-inch squares. Then, lay out this design, making sure your leaf stems point in random directions. Note that the pumpkin blocks face each side in the round. In this design, the topper becomes non-directional, as every side has a pumpkin right side up and one on its side. I put the pumpkin stems in a clockwise pattern, using EQ7. 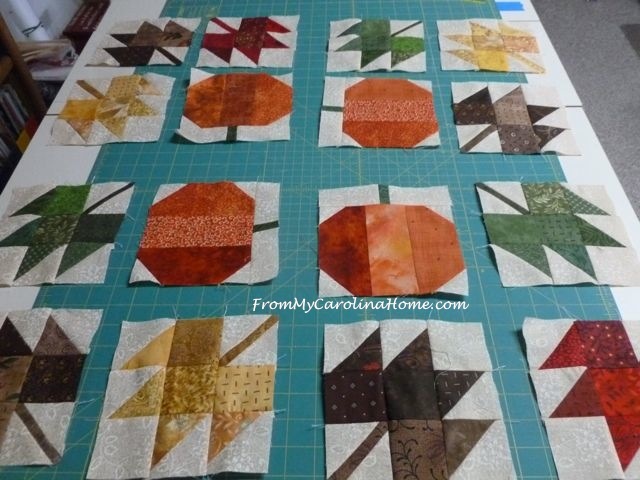 I began with laying out my blocks. Then I put the sashing strips together. Press toward the cornerstones. 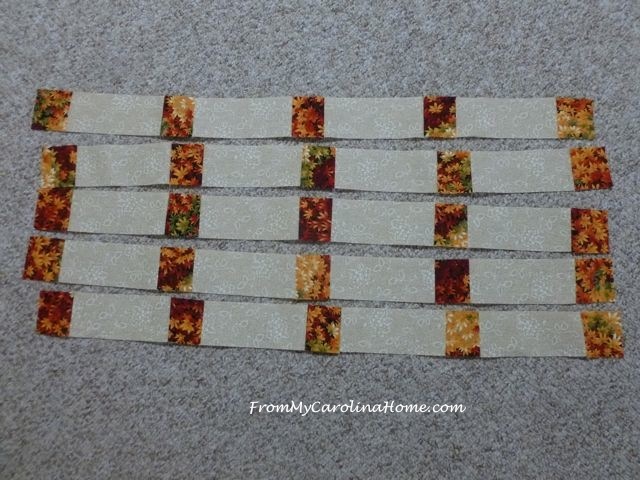 Then sew the rows of leaves and background strips. Press toward the blocks. Lay the rows out to be sure your pumpkins are in the right places, to make one on each row us right side up. Sew the rows together, nesting the seams. All done and bound in a dark brown. Don’t forget, upload your progress pictures to our Autumn Jubilee Flickr group. Backside fabrics is providing the giveaway for today’s post of a $30 Gift Certificate! Just visit Backside Fabrics for their wonderful selection of wide backings, pick out a favorite print, and come back to comment on this post with your choice, or choices. The drawing will be held November 1, so you have plenty of time to enter and tell your friends! Winner has been drawn and notified. What’s your favorite print at Backside Fabrics? My favorite is the Eclectic Elements Correspondence Sateen by Tim Holtz in taupe – I am enjoying your Autumn Jubilee. I like the wide backing with modern inspirational words. Thank you for introducing me to a new online shop in my state! i like most of their fabrics but the dotty waves is so pretty. Your table topper is pretty and great quilting. I love Grunge by Basic Grey, and Essentials by Wilmington Prints. So beautiful. I like Kaffe Fassett 108″ Red Carpet! As a former Postmaster, I’m in love with the Eclectic Elements Correspondence Sateen by Tim Holtz. Love the postmark in the fabric, and I’m so fond of greens that the Charesse Green and Essentials Dotty Waves in Dark Green catch my eye as well. I like the Chromadots – Purple. Love yourpumpkin blocks! My favorite is the Essential Dotty Waves in Gray-great backing for any quilt! I love the Peppered Cottons in any color. They look beautiful. Thanks. I love wide backs and have ordered from this shop before. I have enough of those for the moment but I would love to get more batting! Love, love, love the Kaffe Fassett Cotton Sateens. The colors are so vibrant and just make me feel happy. I Liked Tonal Vineyard. I will need some new backings soon so glad to hear about this shop. I loved their extra wide fabrics – especially the Kaffe ones. I ordered some wide backings for a couple of my quilts. Thanks for the shout out of the shop. The autumn topper turned out so beautifully. The quilting on it is beautiful. I love all the flannel backings! They look very warm and inviting! I love Complementary Flour in every color but especially green. Such a funny name for such a beautiful pattern. Thank you for the introduction to this shop. Yummy and useful wide fabrics. I am pinning this post for the pattern and the shop. the stonehedge collection looks wonderfuly inticing! Your table topper is perfect for the season. I like it! My favorites are Concentric Circles and Charisse. Thanks to Backside Fabrics and to you for the giveaway. Thanks so much for the great pattern idea and thanks for the give away! I’m working on a patriotic quilt for my Dad (95 yrs young veteran) for Christmas and am looking at Complementary Flourish or Prisms in red or Dotty Waves in Blue. Any of them would be perfect for current project. Value collection tonal vineyard really nice…really liked several of them. Love the table topper! Thank you for all the work that is going into this QAL! The backing I choose depends on the quilt I’m making. If making it for a child, I usually go for an all-over novelty print to complement the front. But for an adult, I usually go for a blender-type in a color to complement the front, but will often be a beige or gray – not too light, but not too dark. But since we’re working on holiday projects, I like the American Dreams-Red with stars. I absolutely love my wide backing. So many pretty prints on this site. One I liked was 108″ Eclectic Elements Rose Parcel Sateen. 108″ CHARISSE WIDE QUILT BACKING – GRAY, 108″ SPOT ON WIDE QUILT BACKING – CHARTREUSE, and 108″ ECLECTIC ELEMENTS CORRESPONDENCE SATEEN BY TIM HOLTZ – BLUE are just a few of my favorites. Great selection in the shop! Wide backs are such a great idea! I need to buy more of them for larger quilts. My favorites are the Kaffe Fassett prints (if they would work with the quilt top) and the Stonehenge in any of the colors – I really love the variations in the colors in those fabrics! I really like the Tonga Batik “Leaf” in colorway Reef. I really like MODERN INSPIRATIONAL WIDE QUILT BACKING – SEW*HOPE*FULL. They have a really nice selection of backings. I love this *On Sale! * 108″ Essentials Dotty Waves Wide Quilt Backing – Gray – it could go with so many projects. Now I just need to get out my measuring tape and figure out which ones!!! I would use almost every color that the Charisse by blank quilting comes in – if I had to choose one it would be the grey – such an understated but beautiful print. 108″ Kaffe Fassett Cotton Sateen is just gorgeous….all of them in this line!!! I really like the table topper. I thought the table runner was so neat, and now the table topper wows me even more! 108″ Riley Blake Polka Dot Wide Quilt Backing – Girl is my choice for my charity baby quilt-making! Thank You ! My favorite at Backside Fabrics would have to be “American Dreams”. This print would be perfect for a Quilts of Valor backing. So many great choices! I could see myself using a lot of the widescreen fabrics from Carolyn Friedlander. I like most all of them, but to name just two: Prisms and Value Collection Marbles. I’m making a modern wedding quilt and the 108″ MODERN INSPIRATIONAL WIDE QUILT BACKING #41948-5 would be perfect for the backing. Never knew there was so many options for wide backings. It’s a hard choice between Correspondence Sateen – Taupe and Spiced Pomegranate. Spiced Pomegranate wins. My favorite of all the wonderful quilt backings is 108″ Modern Inspirational Wide Quilt Backing #41948-5 . Yesterday a friend showed me the quilt she is working on where she is writing inspirational quotes for the quilting. And, I love text fabrics. Wonderful backings, my favourite is the pomegranate by Kim Diehl. But I like the moderns as well! from the Primitive Muslin Collection by Moda “Pie Crust”. This is a beautiful tone on tone marble-looking print that will coordinate with many quilt tops. Oh my.so many to choose, but Stonehenge Graduations, Robin’s Egg is my choice. I am so glad I saved the extra leaves and did lots of pumpkins, today’s pattern is the winner. What a great way to finish off this Jubilee. I love the Essential Dotty Waves in the Ivory colour. I love the backings! In the Value Collection, I loved all the gray and white print ones. Those are wonderful. I liked the bright red Island batik, too, and would have to make a quilt to suit it. Thanks for that link. Thanks for the sponsor’s giveaway, and for your work on putting all this together. I’m still working on mine, and I have to make more pumpkins now! So many great ideas. I love the Stonehenge. All of them! This is adorable! Just love how Fall it is!! Tula Pink True Colors is so pretty! I really love all the peppered cottons! Especially the coffee bean color! Your quilt is lovely! Kim Diehl’s Spiced Pomegranate in light tan. There are several others that I like as well. I wpuld love to use Eclectic Elements Correspondence on a quilt. Artsan Spirit Shimmer in royal. It sparkles. Thank you for introducing us to this wonderful store! Up to now, the number of wide fabrics I have been able to find were limited & not too interesting. I am so excited to see this wonderful selection. I want to grab fabric by the armload! Hard to pick a favorite, but I think I will go with Tonga Batik – Reef. It has my favorite colors & I like the design. I will be measuring my latest quilt & coming back for some. I love this site. I was almost late for school because i got drawn in and lost track of time. Affordable and beautiful selleciton. Just wish there were more boy & masculine prints. I liked the gray and white sun burst. 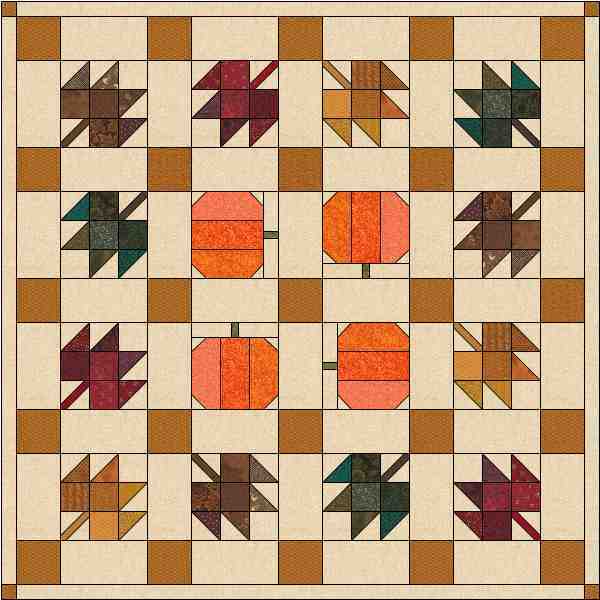 This is a great site for quilt backings. I really love the Stonehenge backings. So beautiful. Thanks for the giveaway. I would like Floral Scroll. I have never seen so many wide backings. I like the Mini Vine – Blue. This is a new company to me as I’ve never heard of BackSide Fabrics before! What a great selection they have and I like how I can search for what I want. One in particular that I like and could use for my son’s quilt would be: 108″ Spot On Wide Quilt Backing – Black. 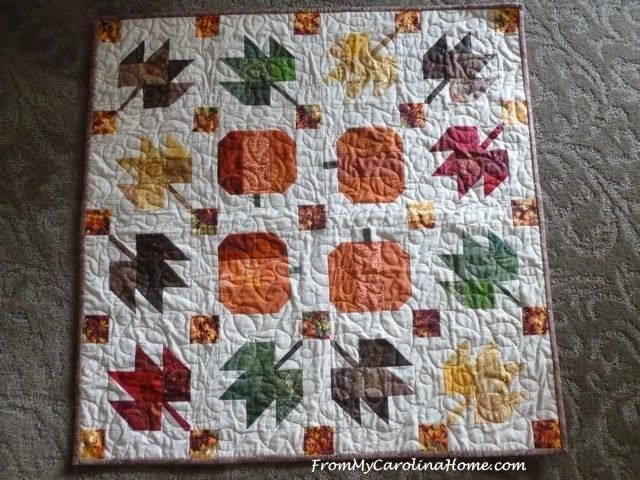 Your leave and pumpkin quilt is delightful! It captures all the beauty and flavor of fall. Thanks for sharing it. And thanks for the chance to win a gift certificate from Backside Fabrics. I love the batik backings. Tri Exotic Leaf is my favorite. I am crazy in love with the 108″ Kaffe Fassett Cotton Sateen Wide Quilt Backings. I am going to have to buy a lot of these as soon as I save a bunch of money. Thank you for giving us a new site for backing fabric. I love the Prairie Vine fabrics. Civil War prints is my thing and this would work wonderfully. I love your table topper. It’s perfect for the season! I love the grunge cream and ash fabric at Backside fabrics. Thanks for the chance to win. Wow, so many great fabrics! My favorite print is the Complementary Flourish. Love your table topper too! I like the Widescreen by Carolyn Friedlander or some Grunge. My favorite is American Dreams. Thanks! Oh…what beautiful backings….I just completed a flannel top for my brother-in-law for Christmas…the Lana in “brown” would be perfect for the backing…and it’s on sale at $14.90 per yard!!!!! The leaves and pumpkins were fun to make. Mine had beautiful fall colors with a red boarder, which made it pop. Sorry I don’t know how to send pictures. I hope you do other projects like this soon. Thankyou so much. I like 108″ Prisms Wide Quilt Backing – Red. I’m still shopping. I need to find that perfect back for my Bonnie Hunter’s Mystery from last year so that I can finish it before the next one begins. Still searching for that perfect back. Thanks for the chance to win! I like the holiday backing fabric Let it Glow. I have plans to make a quick-ish Christmas quilt and this would be perfect! I love the windblown look your placement of the leaves makes on your table topper. What a delightful design for this time of year. I checked out the backings. I’ve used the value collection before and loved the soft feel. I used the sun burst print, floral scroll and daisy stems. I also like the Calla design. The Black and White would be awesome in a rainbow quilt. 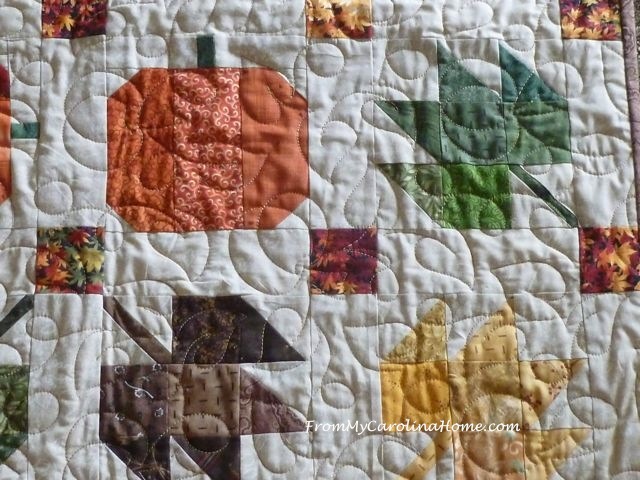 Your table topper is great with the pumpkins and leaves. I’ve already made a table topper with three maple leaves! Love these patterns and will try the pumpkins next! I’m so pleased to learn about an online store that sells wide backings. I’m liking the Spiced Pomegranate by Kim Deihl. American Dream was what caught my eye. I love your table topper. Thanks for the reminder to enter. Love your table topper. Going to get busy now that I am home again. I was not familiar with Backsidefabric.com, so had fun window shopping the website. I think I favor the Charisse in Brown. I like the modern graphic tone on tone. Hi Carole — What size does this finish? 32×32?? I’m late to the party here but saw your quilt on My Quilt Infatuation and loved it. 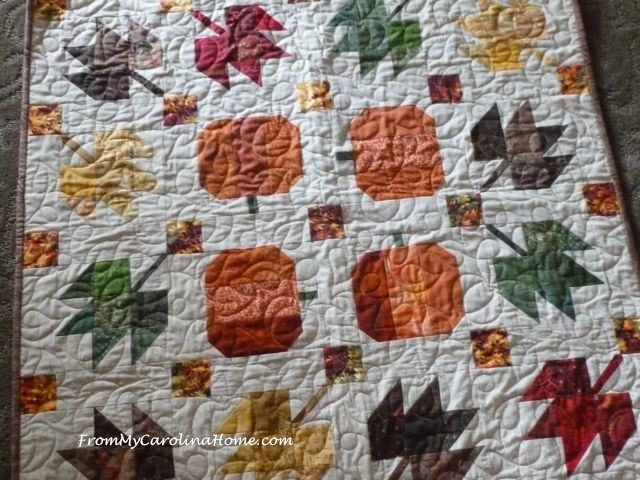 Thanks for sharing the sew along instructions for these sweet leaf and pumpkin blocks. I love this! Hope all went well with your procedure!